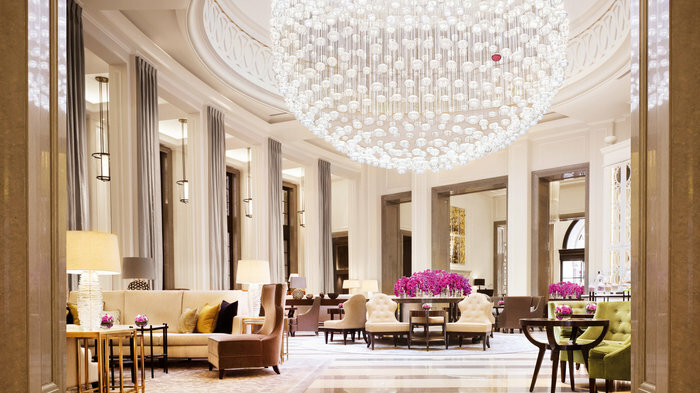 In May 2011 Corinthia London opened its doors after a £300 million refurbishment to reveal one of London's most elegant hotels. Guests at this historic 306-room hotel in Whitehall are greeted by a grand marble entrance and can enjoy a four storey spa. With 294 bedrooms, multi-level penthouse suites and terraces offering spectacular views of the River Thames, Trafalgar Square and Whitehall, the £300 million restoration of the Corinthia Hotel London has brought the building to its original grandeur and purpose - it was first built for the Gordon Hotels Company in 1883 as the Metropole Hotel, one of London's most glamorous hotels. Arranged around an elegant central courtyard foyer, facilities include a choice of restaurants, luxury spa, bar, meeting rooms and the refurbished grand ballroom - used for state balls in the 1880s. The adjoining 10 Whitehall Place property has been redeveloped to include a large ESPA spa as well as a suite of 12 exclusive residences. Served in the grand Lobby Lounge, afternoon tea at the Corinthia is a classy affair. Served in the grand Lobby Lounge, afternoon tea at the Corinthia is a classy affair. Diners are initially greeted by the magnificent site of the 'Full Moon' chandelier, created by Parisian designer Chafik Gasmi and made up of 1001 glistening Baccarat crystals. The menu focuses on quintessentially British cakes, including Battenberg, Eccles cake and Bakewell tarts. Taking into consideration Londons major events, special seasonal options are also often added, such as floral fancies inspired by the Chelsea Flower Show or couture biscuits in honour of the latest catwalk trends from London Fashion Week. Sandwich options include smoked salmon, coronation chicken, Lancashire cheese and piccalilli, and cream cheese and chive while a selection of plain and fruit scones are served with house preserves and clotted cream. Guests can choose between an array of teas, including bespoke blends created especially for Corinthia London's Tea Palace, and there is also the option to enjoy a glass of Laurent-Perrier Champagne. Fresh fish and seafood with a distinct Mediterranean twist. Adding another notch to his London portfolio, David Collins has designed the exquisite Massimo restaurant within the grand 5 star Corinthia Hotel London in Whitehall Place. Serving a Mediterranean seafood a la carte menu with fresh pastas and premium ingredients and featuring a 50 seat Oyster bar as well as an 18 seat private dining room with its own kitchen. Reviews have been mixed, The Independent claiming it to the 'The Perfect Restaurant', heaping praise on this "vast, elegant, Deco-ish brasserie... with its own lost tribe of interesting, arty-looking customers" while The Telegraph reviewer Matthew Norman welcomed "the cheering possibility that no restaurant visited in 2012 will demand to be forgotten as swiftly and completely as this one". Ouch. However, his fellow Telegraph writer Zoe Williams found the dining room "magnificent, with great globular chandeliers that beam with luxuriousness. Excellent seasonal British fare and one of the best burgers in town. The cocktails in the Bassoon Piano Bar are very, very good. And the piano really is a bar. The 3,300 square metre spa is dark, chic and modern with black Italian marble. From cheap budget accommodation to luxury 5 star hotels see our deals for hotels, including Holiday Inn Express London Greenwich from 61% off.